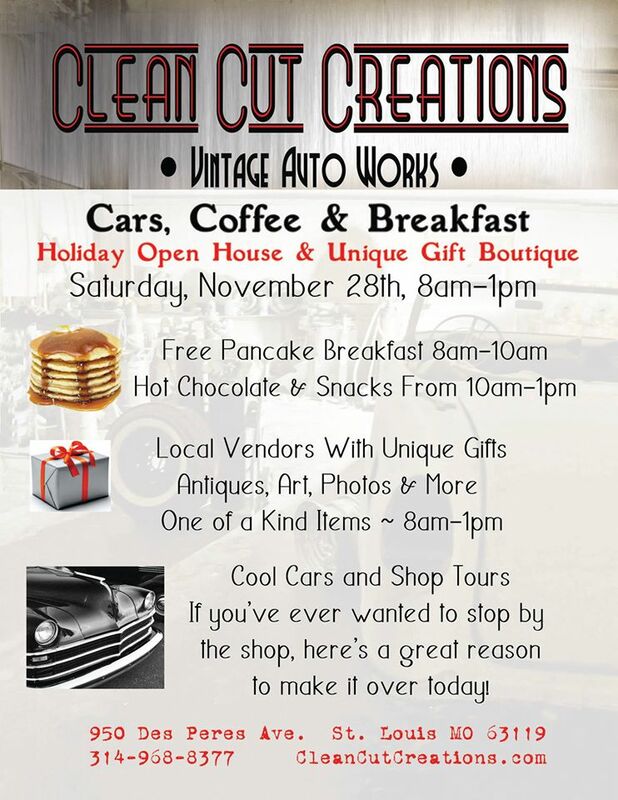 Stop by the shop and join us for a Pancake Breakfast, Open House and Holiday Boutique! Enjoy breakfast and do some holiday shopping from local vendors to support Small Business Saturday! Antiques, vintage clothes, handmade items, unique pinstriped gifts, photographs and more to be added! Interested vendors, please message us here or email to info@cleancutcreations.com. Spots are FREE! Breakfast will be served from 8am-10am. Fall snacks and Hot Chocolate from 10am-1pm. This is a free event and is open to everyone who has a car or just likes cars. If you’ve been looking for a reason to visit the shop, you’ve just found one! This is a rain (snow) or shine event. Check back here for updated details, call the shop at 314-968-8377 or email at info@cleancutcreations.com.